BHAA Eir Cross Country and Club 5k race - Civil Service Harriers A.C. 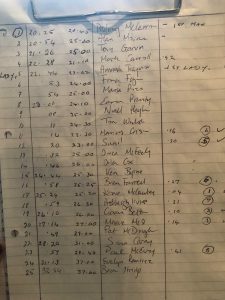 There was another great turnout from the club for latest race in the BHAA calendar – the Eir cross country out in Cherryfield. The weather was a vast improvement on last year so we’d need to be creative with our excuses this year. 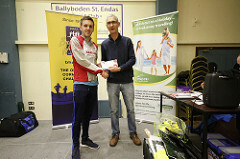 Eoin Devlin brought home the spoils, winning the men’s 5 mile race. Fantastic stuff as usual from Eoin. Patrick Coyle also had a great run on the day, finishing 8th overall. Jason Reilly was just outside the top 10. Great running lads. Gareth Horgan was 28th, with Tibor Kulich and Eoin Kealy not far behind in 31st and 33rd respectively. Dave Hipwell was 39th and for once didn’t win an age category prize which shows how competitive it was out there. Nick Devery, Vincent O’Neill, Chrisy Smith, Mark Carroll and Tony Garvin were also out running. Well done guys! 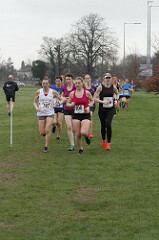 Brid Ryan and Gemma Treacy were our only runners in the ladies race, but they made their mark with Brid finishing 6th and Gemma 7th. Well done ladies! The next race on the BHAA calendar is the Garda cross country, literally in our back garden. Would be great to see big numbers out racing this. It’s on a course we know well from our training and the start line is only a stroll from the club house. You won’t get an easier race! For the women, this race is part of the lord mayor’s race series, which means there’ll be big numbers out so there’s not a chance you’ll be isolated on the course. 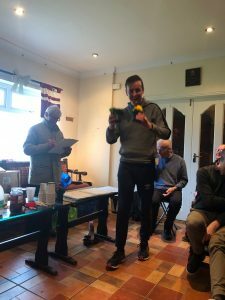 It was a new revised course for the club country race on Sunday, with the added drama of time predictions. Thankfully we had a shorter course but no less challenging. It was a two lap course, starting up Chesterfield avenue into a stiff breeze before looping left around the black wood alongside the Khyber. Lots of mud and tree roots to negotiate! 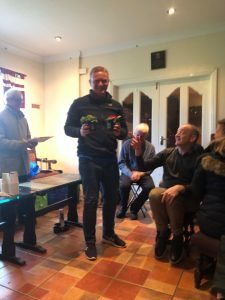 After the race it was a final sprint back to the club house for the coffee morning and the prize giving. Padraig Carron and Amanda Treanor were overall winners. Well done guys! 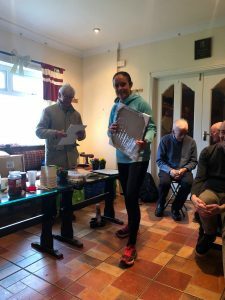 Leonie Macauley won the time prediction – only 4 seconds out! Ciaran Belton, Maeve McQuillan, Bren Farrell and Sunil Singh also won bronzes. Well done guys. Thanks to John Byrne for his hard work in organising today’s race. It was a great morning, and really nice to see so many club members out.